You can think of in a scientific way… all big B’s and little e’s and so on, but this makes zero sense to most people (including me who has been breeding for 21 years, but then i’m lazy like that when it comes to anything remotely ‘maths sounding’ It over complicates something which is quite simple, (once you get your head around) it, and I find to most people it helps to picture REAL dogs. Try to dismiss from your mind the idea a yellow or chocolate ‘carry’ black. EVERY Labrador has the ability to produce black because its ‘the default gene’, so they all *carry* black as such. Therefore its just taken as read. Black Carrying no other colours mated to Black not carrying any other colours = all black puppies. Black carrying chocolate mated to black not carrying chocolate = all black puppies. Black carrying chocolate mated to black carrying chocolate = Black and chocolate puppies. Black carrying chocolate but not yellow mated to black carrying yellow but not chocolate = all black puppies (think about it….). Black carrying yellow mated to black not carrying yellow = all black puppies. Black carrying yellow mated to black carrying yellow = black and yellow puppies. Black carrying yellow and chocolate mated to black carrying yellow and chocolate = black, yellow and chocolate puppies. You starting to see the pattern here? Yellow mated to yellow = all yellow puppies. Yellow mated to black not carrying yellow = all black puppies. Yellow mated to black carrying yellow = black and yellow puppies. Yellow carrying chocolate mated to black carrying yellow and chocolate = yellow, black and chocolate puppies. Chocolate not carrying yellow mated to chocolate carrying yellow = all chocolate puppies. Chocolate carrying yellow mated to chocolate carrying yellow = chocolate and yellow puppies. Chocolate not carrying yellow mated to chocolate not carrying yellow = all chocolate puppies. Chocolate mated to black not carrying chocolate = all black puppies. Chocolate carrying yellow mated to black carrying yellow but not chocolate = Black and yellow puppies. 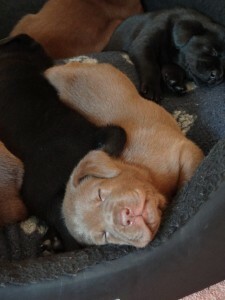 Chocolate mated to black carrying chocolate = chocolate and black puppies. Chocolate carrying yellow mated to black carrying yellow and chocolate = Black, yellow and chocolate puppies. Chocolate not carrying yellow, mated to yellow not carrying chocolate = all black puppies…..
Chocolate not carrying yellow mated to yellow not carrying chocolate. So we know the puppy himself will be BLACK. But he will carry both yellow from one parent and chocolate from the other… so he will be Black carrying chocolate and yellow. There are the odd other colour combination pairing as above but hopefully should that crop up you can now think logically and work out the colour of the offspring.